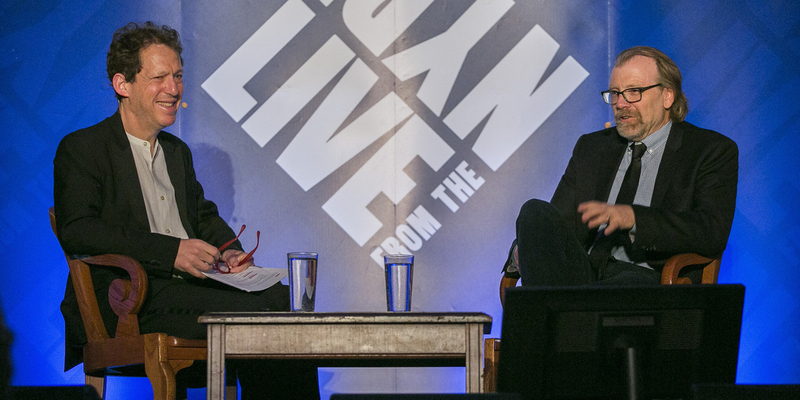 Paul Holdengräber, the director of LIVE from the NYPL, and author George Saunders in discussion on May 2, 2018 at the New York Public Library. All photos: Sarah Stacke / New York Public Library. “IT’S SO EASY TO LAUGH, it’s so easy to hate. It takes guts to be gentle and kind.” These lyrics from my earnest misspent youth dogged me the night of May 2 as I listened to a conversation between the New York Public Library’s leading interlocutor, Paul Holdengräber, and author George Saunders, whose batty 2017 novel, Lincoln in the Bardo, recently won the Man Booker Prize. The refrain bothered me: Morrissey had once been a hero of mine but is now just a walking alt-right-wing meme. The hypocrisy enraged me, though I thought I shouldn’t care. 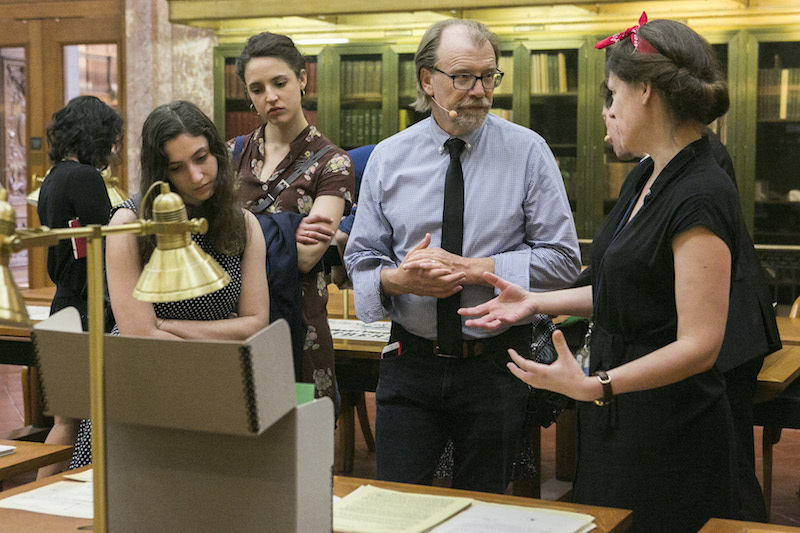 Saunders on a group tour of the library. Saunders discussed growing up on the South Side of Chicago and working as a delivery boy for his father’s restaurant, Chicken Unlimited (its “very Zen” motto: “Chicken Unlimited doesn’t stop at chicken”). He was also a slaughterhouse worker, a doorman in Beverly Hills, and a technical writer. This job history has made him unusually attuned to the workaday woes of late-period America, a nation aggressively proud to have no safety net. “When you come up wanting, the culture does not like you. It is happy to crush you,” Saunders explained, matter-of-factly. This means “there is no graceful cultural way to explain you to yourself.” In his stories, Saunders does the explaining for us. The author described himself as “a lifelong progressive, left of Gandhi” and his political message is one of old—you could say classical—liberalism. I found this good-neighbor approach unsatisfying and felt antsy when the talk turned to Trump. I’ve been in many sad liberal-filled rooms since 2016, and the fretful attempts to explain “what happened” usually make me cringe. Still, Saunders has a sense of self-deflating humor when he ventures a guess. His New Yorker dispatches from Trump rallies across the nation memorably caught the spirit of the overlooked voter newly energized by the future president’s incitation: “A look of religious zeal may flash across the face of some non-chanter, who is finally getting, in response to a question long nursed in private, exactly the answer he’s been craving.” These reports were full of unusually clear and almost mathematical perceptions, as he measured the balance of people’s cruelty and beauty, their power and smallness. If only they were fiction. One of Saunders’s more provocative assertions was that resistance and compassion are the same thing—a notion informed by his longtime Buddhist practice. I wished he’d said more about this, especially when he mentioned “idiot compassion,” a phrase he quoted from the Tibetan meditation master Chögyam Trungpa. (Trungpa’s teachings have spread widely, among sad and anxious people, through his most famous student, Pema Chödrön.) It’s when empathy turns to weak-willed passivity or, as Saunders put it, when “somebody hits you in the head with a rock and you say, ‘Oh, thanks for the geology lesson.’” Life now feels like one endless geology class. What’s an A-student to do? It was nice to hear Saunders admit that he doesn’t exactly know. I have no answers either, but I sensed an opening whenever he spoke about comedy. He once wrote that laughter “is what happens when we’re told the truth quicker and more directly than we’re used to.” He expanded on this to Holdengräber: “Humor is the moment when you realize that all the systems of control that you’ve built up are not going to save you.” Landing a joke creates an instant connection, in other words, one rooted in a shared, intuitive sense of mortality and the zany predicament of being alive. It worked: The audience left giddy. It’s one thing to explain that the tragic and the comic are inseparable, that we need to remember life’s fragility, that the sublime is always closer than we know. Saunders makes us see it. One picture stands out to me: Saunders recalled a funeral for a friend who had died young. When it was over, he walked outside and saw a strip mall across the street with a Chuck E. Cheese’s. Mr. Cheese was on break. He’d taken off his big mouse head and was smoking a cigarette. It takes a writer who entered through the basement, who worked his way up and calmly watched hope and fear, to fully grasp the beauty in that moment.